Dimensions 1 by 5.75 by 8 in. 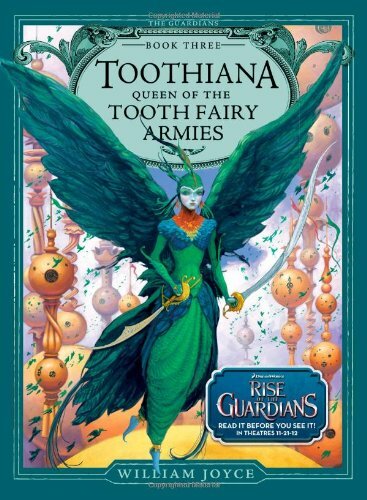 Amazon.com description: Product Description: Beware a tooth fairy queen scorned in this, the third chapter book of Academy Award winner William JoyceÃ¢ÂÂs The Guardians series. ThereÃ¢ÂÂs a lot more to this tooth-swiping sprite than meets the eye! When last we heard, the Guardians were resting easy with the knowledge that the children of Santoff Clausen were finally safe from PitchÃ¢ÂÂs dastardly plans. Whatever PitchÃ¢ÂÂs plans, what he doesnÃ¢ÂÂt know is that thereÃ¢ÂÂs a new Guardian in town, and sheÃ¢ÂÂs not the type to forget old grudges. Actually, sheÃ¢ÂÂs not the type to forget anything--because this Guardian is none other than Toothiana, the Tooth Fairy herself. SheÃ¢ÂÂs fierce and fast and crossing her will lead to a multitude of troubles. And, it turns out that, well, all those teeth she has been collecting? They contain memories. The forgotten memories of childhoodÃ¢ÂÂ¦ including the memories of how to fly. Young Katherine is hopeful that these memories might help her to remember her parents. The Guardians hope theyÃ¢ÂÂll offer even further protection from Pitch. About: Beware a tooth fairy queen scorned in this, the third chapter book of Academy Award winner William Joyceâs The Guardians series.